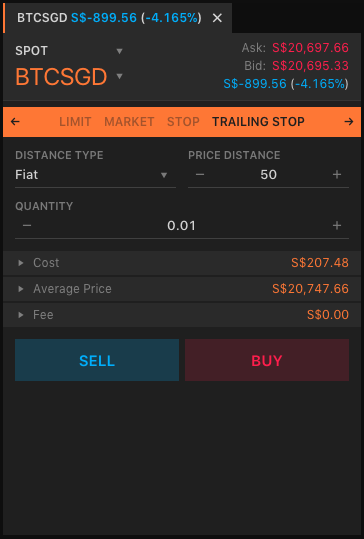 As its name indicates, a trailing stop order follows or “trails” a token’s market price from a given distance. A trailing stop order is more flexible than stop order. Basically, instead of setting a stop or a limit price, a trader sets a certain dollar amount or percentage the market price is allowed to rise or fall before the order is triggered. Direction: The nature of the order, specified as BUY or SELL. Stop Price: The price at which the order is triggered. An order is not filled until the designated price is reached. Distance: The specified dollar amount or percentage that a token’s value may fall below the market price. Size: The amount of tokens to be bought or sold, e.g., 1,000 QASH. In the case of margin trading, these order types may sometimes be referred to as Trailing Stops for Open Positions. So, when the market price goes down and the bid price drops to $1,900 USD, the stop order will be triggered and a sell market order automatically placed. But what if BTC’s value keeps rising? 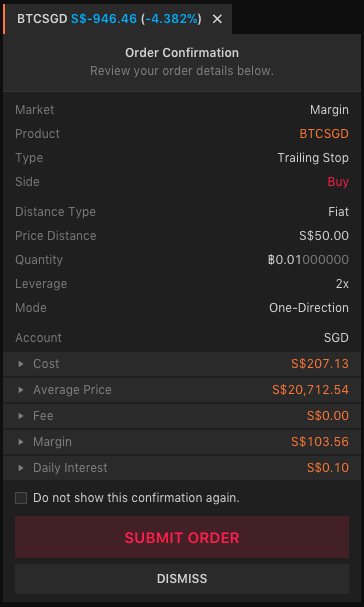 With a stop order, the triggering price is fixed, but with trailing stop order, the triggering price moves along with the market price at the distance percentage chosen by the trader. So, if the price of BTC rises to $2,400 USD, the triggering price will rise to $2,280 ($2,400–5% *$2,400). A buy trailing stop order works in a similar fashion as a sell trailing stop order, but in the opposite direction. For example, you borrowed 1 BTC from QUOINE and sold at $3,000 USD. 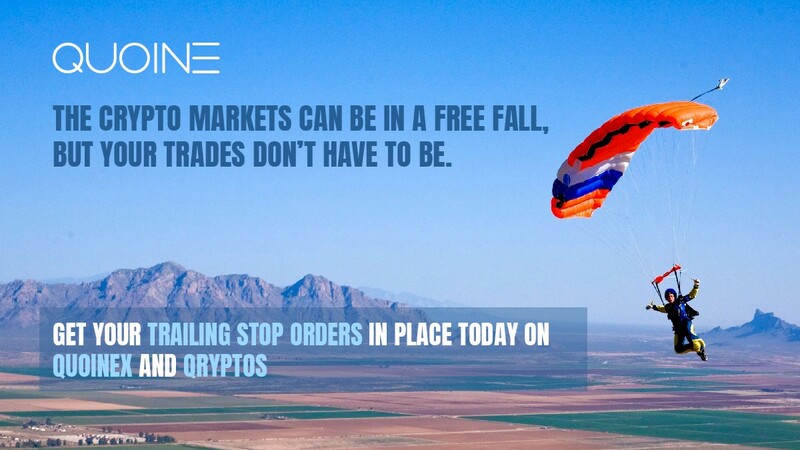 You need to buy 1 BTC to pay back QUOINE, but you don’t want to lose more than $100 USD on this trade if the market price goes up. What you can do is set a buy trailing stop order with a price distance of $100 USD. 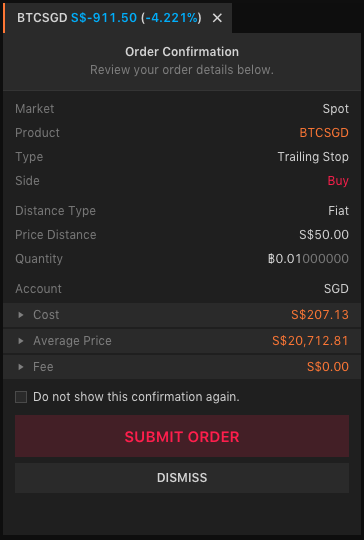 So, when the market price and the ask price go up to $3,100 USD, the trailing stop order will be triggered and a buy market order automatically placed. Then, you can buy BTC at $3,100 USD to pay back QUOINE, given you already made $3,000 for selling BTC previously. Thus, you would only lose $100 USD. In the event that the market price goes down, the triggering price moves along as well at the distance set by the trader. For example, if the price of BTC goes down to $2,500 USD, the triggering price would go down to $2,600, and you would profit $400 USD. From the Main Menu, click Trading Dashboard. Choose SPOT in the drop-down list inside the order entry panel. Inside the order entry panel, click Trailing Stop. Choose your price distance, distance type (fiat or percent), and quantity. Click Buy or Sell to submit. A popup confirmation will ask you to confirm the order you are about to make. Click Confirm to agree to place the order, or Dismiss to stop the action. If you click Confirm, the next popup will confirm that the order has been placed successfully. Click Dismiss again. You can monitor your orders in the Orders panel (under the chart if using the horizontal layout, or right of the chart if using the vertical layout). Click MARGIN in the drop-down list inside the order entry panel. Choose your price distance, distance type (fiat or percent), and quantity. Select the leverage rate and trading mode. QUOINE offers leverage rates from 2x to 25x. At 25x, you will be asked to confirm that you are aware of the high risk in margin trading and the profits/losses it can incur. 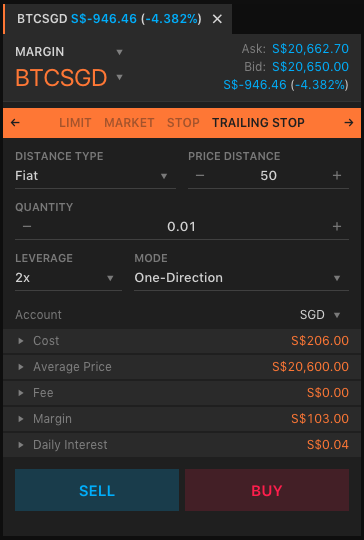 For Mode, QUOINE offers One-Direction and Two-Direction trading modes. In One-Direction, once you place a long or short order, the next order you place must be in the same direction (long for long, or short for short). In Two-Direction, the next order you place can be in the opposite direction. If your order is fully filled, it will not show up under the default view of Orders panel (“Live” status). You can change the filter to the “All” status to see the order, or switch to the Positions panel for better monitoring.